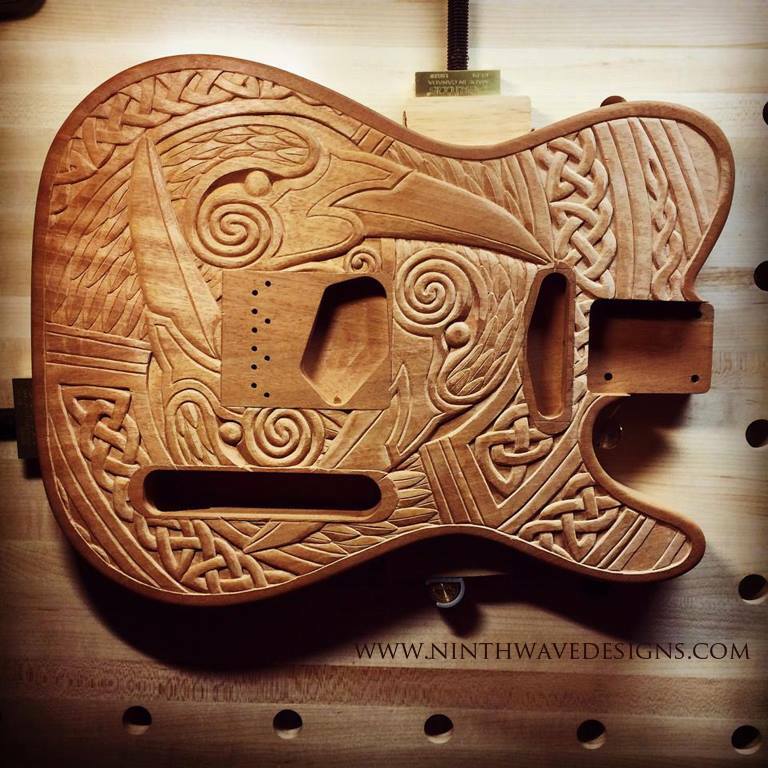 I recently completed the carving process of the Triple Raven Tele-style guitar body, shown above. I will spend a few more hours cleaning up around the component routs and giving the whole thing a final touch up, but it is otherwise complete. I am looking forward to sealing this carving with an oil and wax finish which should really make this gorgeous piece of Honduran mahogany wood glow. I wrote about starting the project a while back on the NWD blog – you can read the full post HERE. Below is a gallery of photos from the various stages of the carving project, with a few newer ones not shown in the earlier post. I am very pleased with how this carving has developed and I am already designing my next guitar body carving in my head. You can follow future carving projects on my Instagram account HERE, or my Facebook page HERE. This is the original Tele-style guitar body in Honduran mahogany which I purchased pre-drilled and routered for the guitar components. The original Triple Raven design is around 4 inches in diameter and was created as a painting on paper using watercolor inks. I enlarged and drew the full-scale design drawing with pencil on graph paper. I photocopied the drawing to use as a template and used the copy to transfer the design to the guitar body. Here the drawing is transferred onto the wood. The beginning stage of carving – roughing out the design. Some of the hand carving tools I used for this carving – with the carving bench in the background. Here the first raven is carved and I have moved onto carving the second one. Carving some of the fine detail with a micro carving tool. Two of the ravens are carved, working on the third. A detail of the feathers from one of the ravens. Carving around the routered pocket for some of the components. 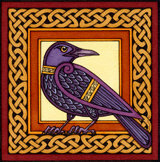 The third raven is carved. Carving some of the knotwork near the neck. A detail of carving knotwork.